For the non-profit corporation based in Seattle, see PONCHO. A Peruvian chalán dancing marinera on a peruvian paso horse. 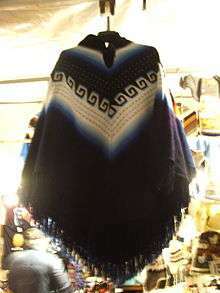 A poncho (Spanish pronunciation: [ˈpontʃo]; punchu in Quechua; Mapudungun pontro, blanket, woolen fabric) is an outer garment designed to keep the body warm. A rain poncho is made from a watertight material designed to keep the body dry from the rain. 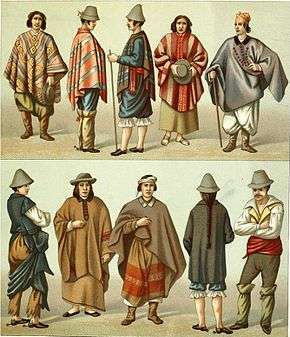 Ponchos have been used by the Native American peoples of the Andes since pre-Hispanic times, from places now under the territory of Peru, and are now considered typical South American garments. 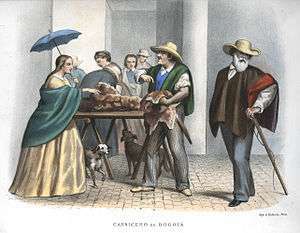 In its simplest form the poncho is essentially a single large sheet of fabric with an opening in the center for the head and often it has an extra piece of fabric serving as a hood. Rainproof ponchos normally are fitted with fasteners to close the sides once the poncho is draped over the body, with openings provided for the arms; many have hoods attached to ward off wind and rain. Alternative ponchos are now designed as fashion items. They are the same shape but of different material. They are designed to look fashionable and provide warmth while remaining breathable and comfortable, rather than to ward off wind and rain. These are often made out of wool or yarn, knitted or crocheted. Ponchos with festive designs or colors can be worn at special events as well. Mapuche cacique Lloncon wearing a poncho in 1890. Alpaca Ponchos at the Otavalo Artisan Market in the Andes Mountains of Ecuador. Poncho chilote, a heavy woolen poncho of Chiloé Archipelago. The poncho was first used on a regular basis in the 1850s for irregular U.S. military forces operating on the U.S. Western Plains. These early military ponchos were made of gutta percha muslin, a latex-coated, waterproof cloth. Ponchos made of gutta-percha or India rubber coated cloth were officially adopted during the American Civil War, both as rain clothing and as a ground sheet for sleeping. While originally intended for cavalry forces, they were widely used by infantry as well; General Sherman's Union troops, lightly equipped and living off procurement demand from the local populace, wore ponchos during wet weather encountered during the march through Confederate Georgia to the sea. Discontinued after the Civil War, the U.S. Army again issued ponchos of waterproof rubberized canvas to its forces during the Spanish–American War of 1898. Two years later, both the Army and the Marines were forced to issue waterproof rubberized cloth ponchos with high neck collars during the Philippine–American War in 1900. With the entry of the United States into World War I, both doughboys and Marines in France wore the poncho; it was preferred over the raincoat for its ability to keep both the wearer and his pack dry, as well as serving as a roof for a makeshift shelter. During World War II, the German Army (Wehrmacht) issued the Zeltbahn (see Shelter half), a poncho that could be combined to form tents. A typical four-man tent used four Zeltbahnen. Clint Eastwood famously wore a poncho as the lead character for each of the films he starred in for Sergio Leone (A Fistful of Dollars, For a Few Dollars More, and The Good, the Bad and the Ugly). This gave him a distinct look in comparison to other cowboy characters in films which usually preferred dusters. Aguayo a typical Andean piece of cloth. Belted plaid, a garment that could also double as a blanket or groundsheet. Rebozo longer scarf like shawl without hole, tied around shoulder and can be used to carry a baby. ↑ Muñoz Urrutia, Rafael, ed. (2006). Diccionario Mapuche: Mapudungun/Español, Español/Mapudungun (in Spanish) (2nd ed.). Santiago, Chile: Editorial Centro Gráfico Ltda. p. 183. ISBN 956-8287-99-X. ↑ Merriam-Webster Online Dictionary. "Poncho". Retrieved 12 September 2010. ↑ Harper, Douglas. "OnlineEtymologyDictionary: Poncho". Retrieved 12 September 2010. ↑ Photo Gallery of the Paracas Clothes - A Poncho of 200 B.C. 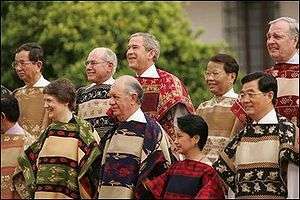 Wikimedia Commons has media related to Ponchos.